MagPump’s 9mm Mag Loader Saves Thumbs! The made-in-USA MagPump comes with a transferable warranty. A group of friends and I once ran 10,000 rounds through a single Battle Rifle Company AR in eight hours. We pushed ten 30-round magazines through the gun, poured cold water over the barrel, and started all over again. In 10,000 rounds there were less than half a dozen stove pipe failures, all of which were cleared immediately and painlessly. It was a blast, but that’s a whole bunch of magazine stuffing. When I was a soldier we would sometimes have 100 guys at the range along with multiple thousands of rounds of ammunition. The Army doesn’t care. We were just machines, but thumbing rounds in all those magazines sure got tedious. Now MagPump proves yet again the timeless adage there’s an engineering solution to every problem. One size fits all: The MagPump 9mm magazine loader comes with several adapters to fit a variety of guns. Other adapters are available for special order. MagPump makes magazine loaders for AR, AK and 9mm handgun magazines. We got hold of the handgun loader, which is constructed from some kind of indestructible fiber-reinforced synthetic material that looks impossible to damage. However, if you manage to ding it in some way, MagPump offers a no-questions-asked transferable warranty no matter who ends up with the machine. The loader comes with a pile of adapters that let the machine run SIG, CZ, GLOCK, S&W, Ruger and Springfield Armory handgun magazines. Adapters for most every other double-stack pistol magazine known to man are available as well (single stack adapters are currently in the pipeline). Adapters pop in and out in less time than it takes to describe. To use the device you snap your magazine in place and dump up to fifty 9mm rounds loose in the hopper. The machine sorts the individual cartridges and gets them oriented automatically. You then just pump the handle to fill the magazine. You can load about a round a second. Once the magazine is filled you squeeze a lever and swap the loaded mag out for an empty one. The hopper assembly comes off the loader by pulling a pair of retainer pins that renders the loading machine small enough to fit inside a typical range bag. The base also sports holes which allow bench mounting but that’s really not necessary as the device is plenty stable to run any place you have a flat surface. This lets you take it to the range and load your magazines, no matter how austere the circumstances. To charge the MagPump just dump up to 50 loose 9mm rounds into the hopper. The loader outfitted for the above-listed guns will set you back $149.99. The workmanship is superb, and the design is just neat as can be. The machine is actually kind of fun to watch. There are little slots in the device to help keep track of what the rounds are doing. A variety of cams, rams, and widgets spin, straighten, and cram each individual round until it is ready to enter the magazine. In operation the magazine is oriented spine up so you can keep track of your progress through the index holes in the back of the magazine. If you shoot a lot and don’t want to waste range time thumbing rounds into magazines this is your tool as it’s much easier to cycle that handle than manhandle loose rounds into a double stack/single feed pistol magazine. This is all the more true when it comes to high-cap magazines like those extended 33-round GLOCK monsters. Where the MagPump really comes into its own is in an institutional setting. At a military or LE range you might have to load dozens — if not hundreds — of magazines at a sitting. I’ve thumbed rounds into magazines until my fingers bled in the distant past. 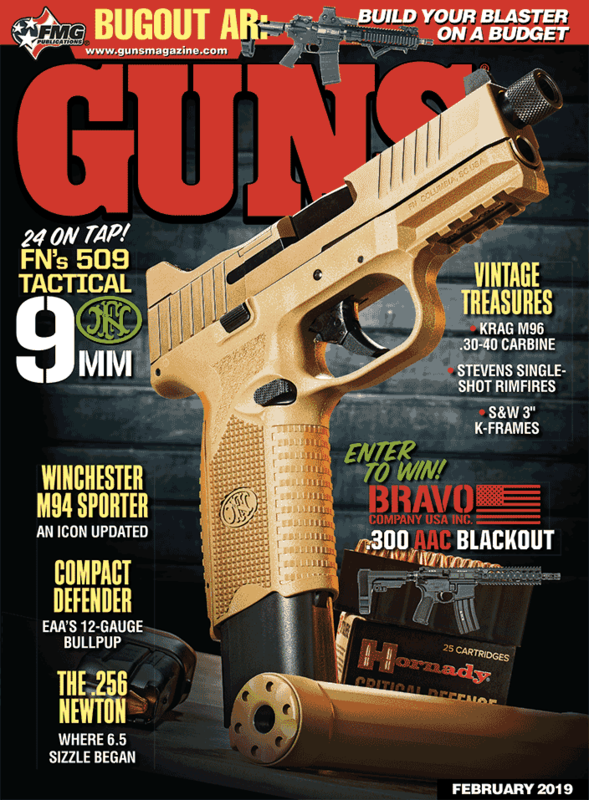 With the MagPump, the lowest-ranking private can sit there and stuff magazines all day long without breaking a sweat. If your 9mm sports a double-stack magazine, the MagPump will likely fill it.